Home Innovation Could Carbon Farms Reverse Global Warming? Could Carbon Farms Reverse Global Warming? A recent study by German researchers presents the possibility of “carbon farming” as a less risky alternative to other carbon capture and storage technologies. 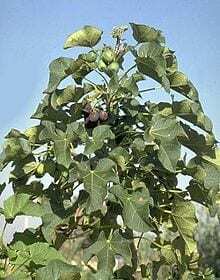 It suggests that a significant percentage of atmospheric CO2 could potentially be removed by planting millions of acres of a hardy little shrub known as Jatropha curcas, or the Barbados nut, in dry, coastal areas. But other experts raised doubts about the study’s ambitious projections, questioning whether the Barbados nut would be able to grow well in sandy desert soils and absorb the quantity of carbon their models predict. The researchers behind the study say Barbados nut plantations could help to mitigate the local effects of global warming in desert areas, causing a decrease in average temperature and an increase in precipitation. If a large enough portion of the Earth were blanketed with carbon farms, they say, these local effects could become global, capturing between 17 and 25 metric tons of CO2 per hectare each year over a 20-year period. The study, published in the journal Earth System Dynamics, states that if 730 million hectares of land — an area about three-quarters the size of the United States — were devoted to this method of carbon farming, the current trend of rising atmospheric CO2 levels could be halted. Carbon farms would not compete with food production if they were concentrated in dry coastal areas, the researchers said. In their scenario, oceanside desalination plants, partially powered by biomass harvested from the plantations themselves, provide a low-emissions irrigation method. April 17, 2019 - Farm safety laws, carbon tax on the block as Alberta's UCP elected Western ProducerThe United Conservative Party will be Alberta's new government, receiving a majority mandate from voters Tuesday night. The party, at the helm of. April 17, 2019 - Offshore Wind Farms Are Spinning Up in the US—At Last WIREDBigger turbines, taller towers, and longer cables are making offshore wind farms more attractive than ever before. March 28, 2019 - Coffee farmers reduce carbon emissions through diversification AGDAILYDouble shot of carbon emissions reduction, please. Coffee farmers can reduce their carbon footprint by growing different plant species alongside coffee. The Founder of Vence Created a Way for Farmers to Control Animals From Their Phones. The Implications Could Be Huge - Inc.
April 1, 2019 - Young farmers are challenging convention to improve sustainability Popular ScienceTwo young growers are living their passion for farming and environmentalism through their organic, carbon farming businesses.